Elizabeth Carey Smith talks about her observational lettering and imaginary alphabets with desktop magazine. 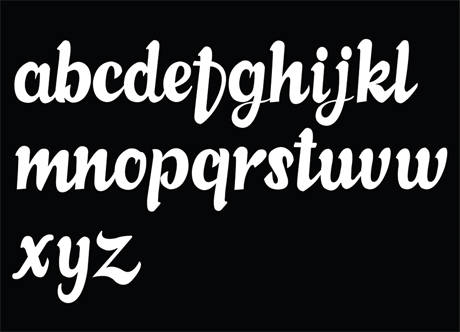 Have you ever walked past a hand-drawn sign and thought that it would make a great typeface? Elizabeth Carey Smith did just this via a number of signage sites in Melbourne, producing these as entire alphabets presented as a series of posters known as ‘Imaginary Alphabets’. Elizabeth is the Design Director at Zady, the pre-eminent ethical fashion label, tackling supply chain issues across the environment and labor. She has also taught graphic design and typography for the past four years at the City College of New York, and has taught numerous workshops in NYC. Her work has been featured in the Wall Street Journal, Huffington Post, Desktop Magazine, Etapes, Jezebel, BUST, and many other publications. She is an avid member of the typographic community and one of the founding members of Alphabettes, an organization for and by women in type. I first discovered Elizabeth's imaginary alphabets project via this article on Desktop magazine. As an enthusiastic cheerleader for creative sideline projects and as someone who teaches observational lettering exercises in my workshops I was super excited to read about Elizabeth's self initiated found type projects. "I started the project because, as a new freelancer, I wanted something productive to occupy my time between projects. I’d been thinking about it vaguely for some time, and thought I’d act upon it. I’d walked by that Lucattini sign [that inspired the first imaginary alphabet] a number of times and always marvelled at the script. To this day, I’ve never seen another like it. Even though I’ve always been a type- and letter-based designer (in my thinking process anyway), I hadn’t drawn many letterforms since leaving art school in 2002. Certainly not full alphabets. The project became a challenge to see how much existing structure was needed for me to ‘fill in the blanks of found lettering’, which became the tagline to Imaginary Alphabets. I started thinking about the letters as 26 children, who all had to look related, but of course retain their own personalities. There may be other similar projects out there, but when I come up with an idea I purposely don’t look around the web. I don’t want to skew the results or dampen my enthusiasm, so there are no precedents aside from the challenge itself and, of course, wanting to maintain a quality that type designers and purists could appreciate."